The working title of this one suggests a juxtaposition. The Dell EMC PowerEdge T340 is absolutely one of the best built, and most solid Intel Xeon E-2100 series servers on the market. Indeed, the Dell EMC PowerEdge T340 even feels like a more substantial server than the HPE ProLiant ML110 Gen10, HPE’s single-socket Intel Xeon Scalable-SP slotted above the PowerEdge T340. As you will see in our PowerEdge T340 review, the server is a lower-cost platform in a server shell that would not look out of place in a server that costs five or more times as much. In our review, we are going to show you the hardware behind the PowerEdge T340. We are going to benchmark the system, show the power consumption, then give our final thoughts. In the end, you will see why we call this the high-end low-cost server. The size of the Dell EMC PowerEdge T340 is nothing short of impressive. Here we have the Dell EMC PowerEdge T340 on the bottom and the PowerEdge T140 we reviewed above it aligned on the back corner. 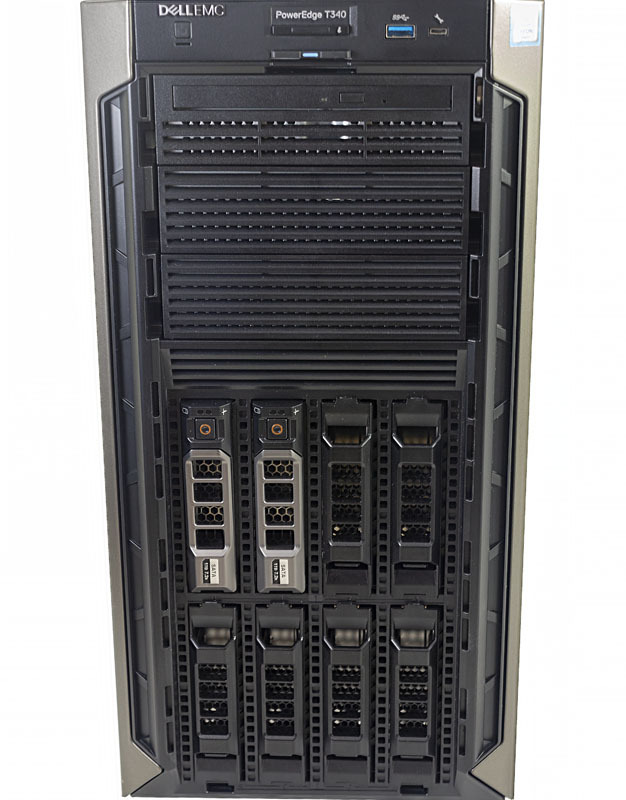 The PowerEdge T340 is significantly bigger along all three dimensions. As you will see if you flip between that review and this review, the systems use the same size motherboard. There are differences in storage and power supplies but the Dell EMC PowerEdge T340 is for some reason bigger. 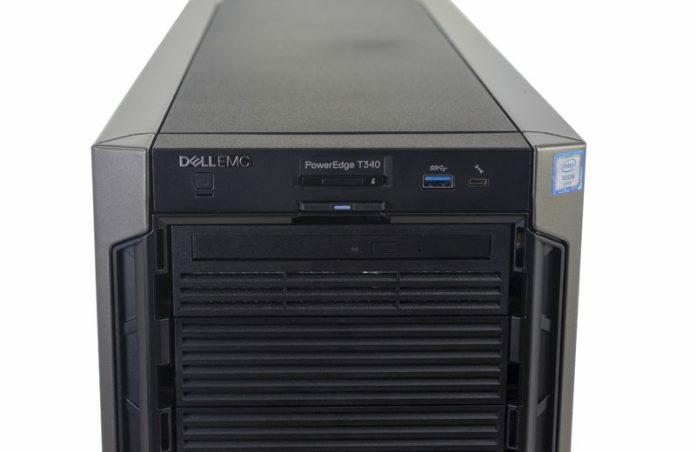 After reviewing these two servers, and competitive offerings, we have one explanation: the Dell EMC PowerEdge T340 is the perfect server to make it look like you purchased something that is extremely high quality without an accompanying large price tag. If you are a VAR or service provider and want to deliver an Intel Xeon E-2100 server to your clients that looks and feels like a $10,000+ server, this is it. 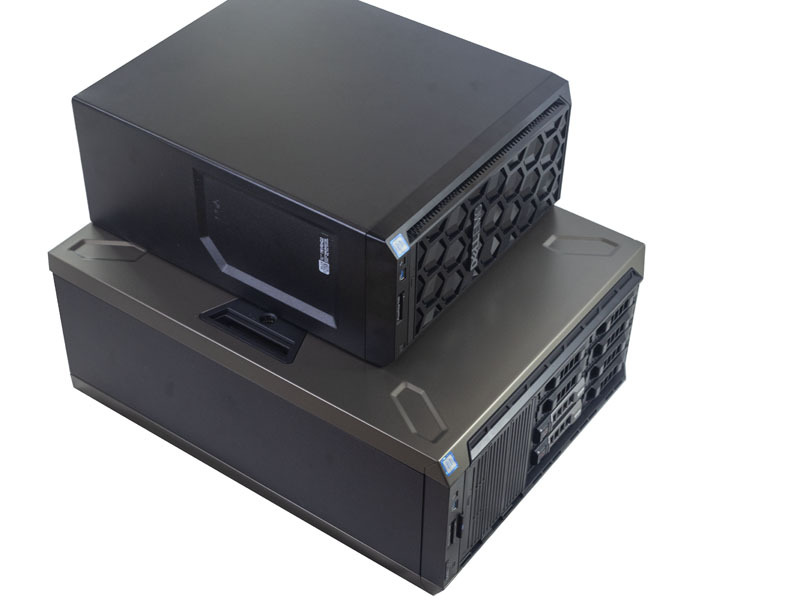 From a competitive standpoint, the HPE ProLiant ML30 Gen10 is only slightly larger (same width, 0.8 inches deeper, and 0.33 inches taller) than the Dell EMC PowerEdge T140. Moving up the HPE stack to the Skylake-SP based HPE ProLiant ML110 Gen10, the PowerEdge T340 is still significantly larger. 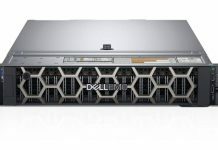 To the casual observer, one would probably assume based on size and materials quality that the PowerEdge T340 is the higher-end platform versus the ProLiant ML110 Gen10, even though the HPE unit is targeted at a segment above the Dell. If you are a channel partner quoting either, this is a case where the PowerEdge T340 case will make a statement. The front of the Dell EMC PowerEdge T340 is a massive wall. The 16.94″ x 8.58″ x 23.7″ chassis (excluding PSU protrusion, feet, and bezel.) 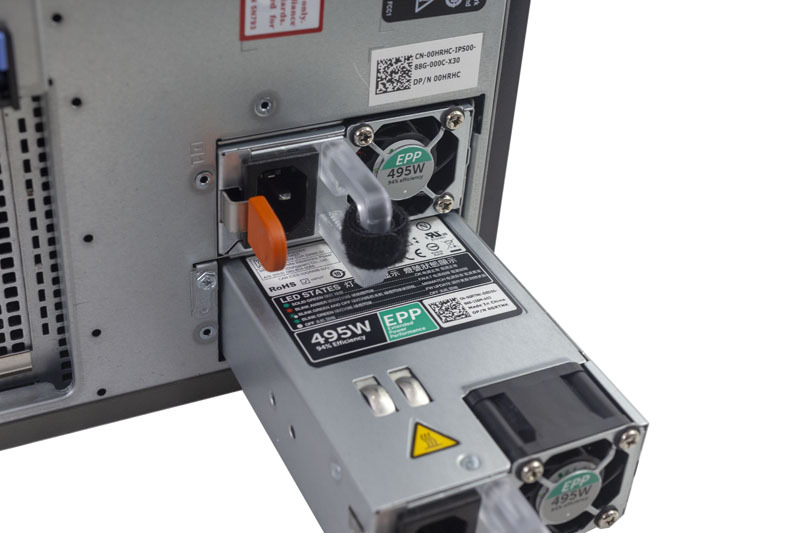 Atop the face wall, there are standard power, USB 3.0 and service ports along with an assortment of LEDs and the service tag. Even targeted at a lower price point, this is still a PowerEdge server. Below that array are three 5.25″ bays. Our test unit even came with a slim optical drive mounted in a 5.25″ bay. 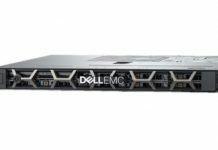 One of the standout features of the Dell EMC PowerEdge T340 is its eight 3.5″ bays which can also accept 2.5″ drives with carriers. We wanted to take a moment here and note the placement of the bays. Dell EMC could have likely fit a fifth 3.5″ bay in each row from a physical space standpoint. Instead, the product team spaced the hard drives further apart to provide more room to cool the drives. That lowers airflow requirements, in turn, making a less noisy server. This is a small design element, but touches like these in aggregate make a better server. Moving to the rear of the unit, you can see again how much space there is between components. From left to right there is a cooling fan, the rear I/O, four add-in card external slots, then redundant power supplies. We are going to take a look at these sections with the exception of the add-in card slots which we will look at from an internal perspective later in this review. 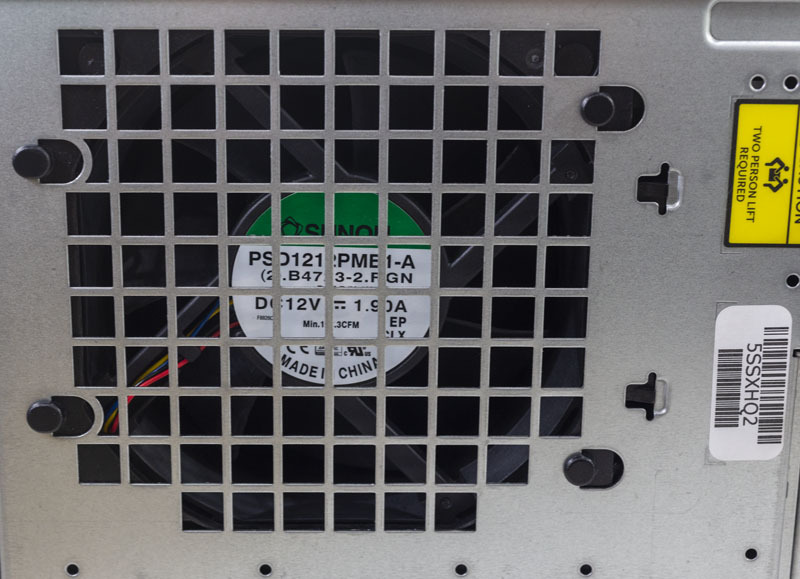 The 120mm cooling fan found in the Dell EMC PowerEdge T340 is much larger than the ones you would find in a typical rackmount server. This moves air while maintaining lower speeds resulting in quieter cooling. The rear I/O is fairly standard for this class of server. There are legacy VGA and serial ports along with four USB 2.0 ports. The Dell EMC PowerEdge T340 also includes two USB 3.0 ports which allow for faster USB or external hard drive transfers for the SMB space or OS image loading. There are two 1GbE network ports along with an iDRAC management port. We are going to discuss the iDRAC management later in this review as that deserves its own section. As an upgrade from the Dell EMC PowerEdge T140, the PowerEdge T340 includes either a single 350W power supply or redundant power supplies. Our test unit had the redundant power supply option and so we see 94% efficiency 495W power supply units. Like higher-end PowerEdge servers, these have the same features such as an easy latch and a LED lit handle. The key themes of our external Dell EMC PowerEdge T340 overview are that the server is large and well built. 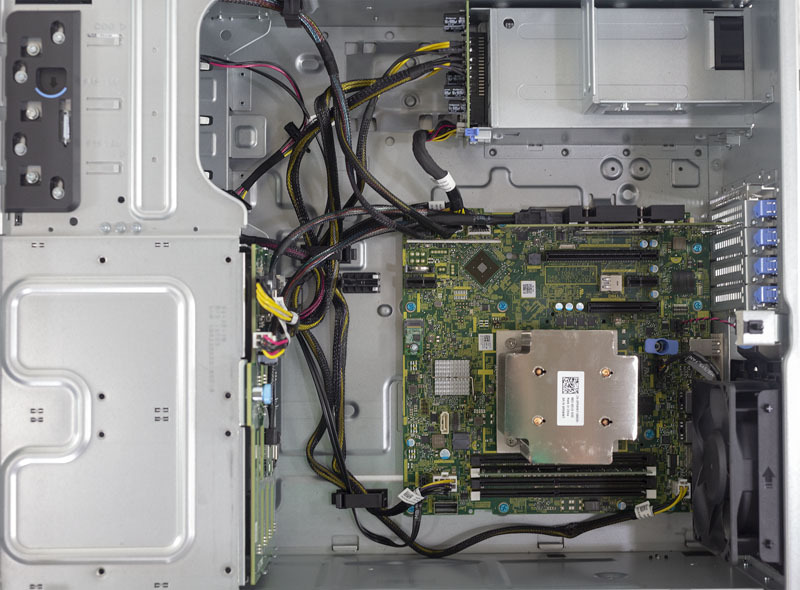 For many IT buyers, visual perception of a server matters, and here the PowerEdge T340 will impress. 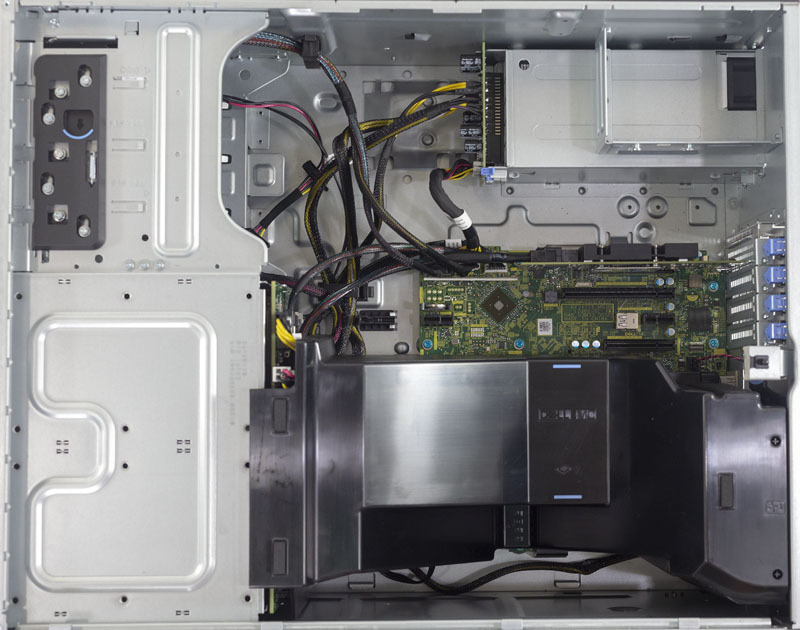 Next, we are going to look at the interior of the PowerEdge T340 before moving on to the rest of our review. Part of the journey in any of our server reviews is tearing them apart. The first step in that is often figuring out how to get them open. 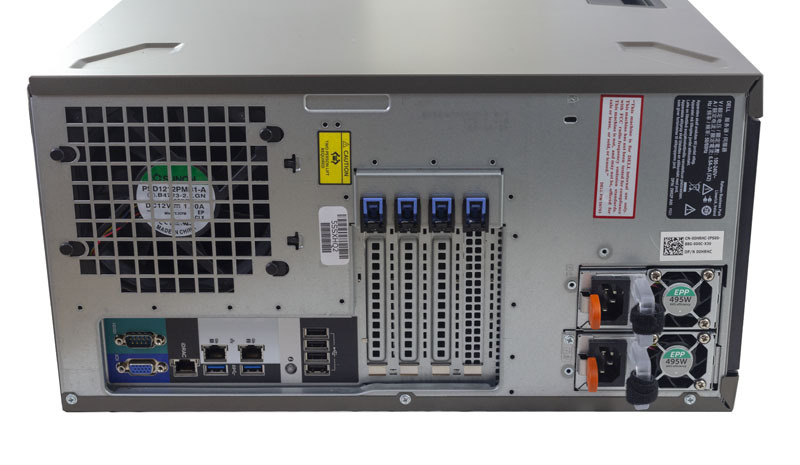 With the key themes of size and quality being reinforced yet again, please draw your attention to the latching mechanism on the PowerEdge T340. The latch to open the chassis is fluid in its operation and upon inspection, one can see why. This latch mechanism takes up so much space and is so robust, that it would not look out of place on a fire truck holding life-saving equipment. In the large and well built PowerEdge T340, this is simply how the product management team saw fitting to access the inside, and we agree. 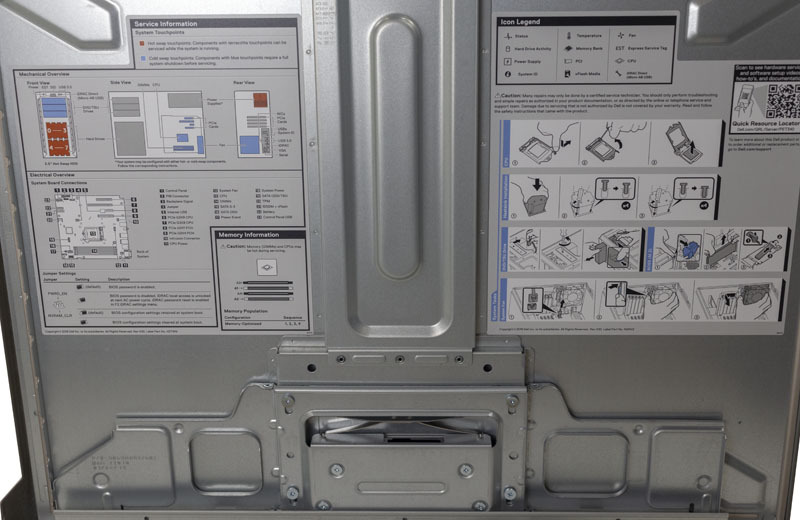 The inside of the case panel serves a practical purpose aside from being a barrier. As with other Dell EMC PowerEdge servers, there is a set of documentation that can help an IT professional, or someone at a remote site trying to service the machine later, perform most physical maintenance tasks. This is a feature that we expect from top tier vendors like Dell EMC, but many white box solutions do not have, especially in this class of servers. Inside the chassis, we find a lot of empty space. The motherboard is flipped upside down compared to a normal mATX motherboard implementation and we see an air baffle directing air from the hard drive cages, through the CPU heatsink, and out the back of the chassis. That 120mm fan cools the majority of the system’s functional components. Removing that air shroud, one can see the layout of the machine a bit better. One can also see that there is a lot of empty space in this chassis. Cables have tie downs to keep them in place, but there is enough room for a ball of cables in here. At the heart of the Dell EMC PowerEdge T340 is the Intel Xeon E-2100 series or select other SKUs like the Intel Core i3 or some Intel Celeron CPUs. That also means that there are four DDR4 DIMM slots supporting ECC UDIMMs. Current DDR4 ECC UDIMMs can hit 16GB capacities, however, in 2019 we are seeing 32GB ECC UDIMMs sampling. That may mean the Dell EMC product team will have an opportunity to upgrade the system from 64GB of maximum memory to 128GB in the future. Here we have three of those four open and our PERC card installed at the edge. One can also see a USB 3.0 Type-A internal header next to the PCIe x1 slot. You will notice that with the air baffle installed, there is no active fan blowing over the PCIe area. 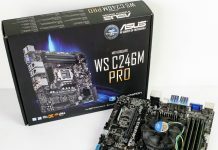 The PCIe 3.0 x16 slot can handle 75W cards, which is about the same TDP as the CPU. If you have a 75W GPU, for example, we highly suggest looking for one with a blower-style cooler. For higher-speed NICs and SAS controllers, and other PCIe devices, one needs to be mindful of the cooling they can receive in this chassis. If you saw our Dell EMC PowerEdge T140 Review, this motherboard will look very familiar. There are a few noticeable differences, one being the 7-pin SATA port (white) in the photo above that was on our PowerEdge T140 review system motherboard. Our sense is that the Dell EMC PowerEdge T340 and T140 share the same base motherboard design which is good to both reduce cost but also to harden and maintain the design over time. Before ending the internal discussion, we wanted to briefly look at the SAS/ SATA backplane. Here Dell EMC is using a PCB that can be swapped without tools. Power is provided to the backplane and data connectivity is via SAS cables. This is much higher-end than some of the white box solutions where connectivity is provided via individual 7-pin data cables. 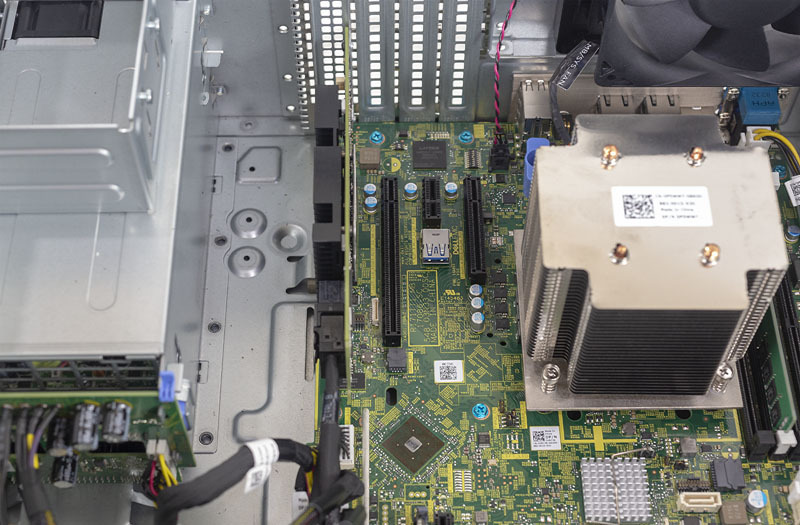 That backplane design is a cost-saving measure over some of the higher-end power-edge designs, but it is also one that is considered robust in this server segment. In this picture, you will also see a standard SATA power cable in the background. That is a feature that will be welcome if you customize this server via the 5.25″ bays and one that the HPE ProLiant ML110 Gen10 lacked. Next, we are going to look at the test configuration and topology before delving into management and performance. 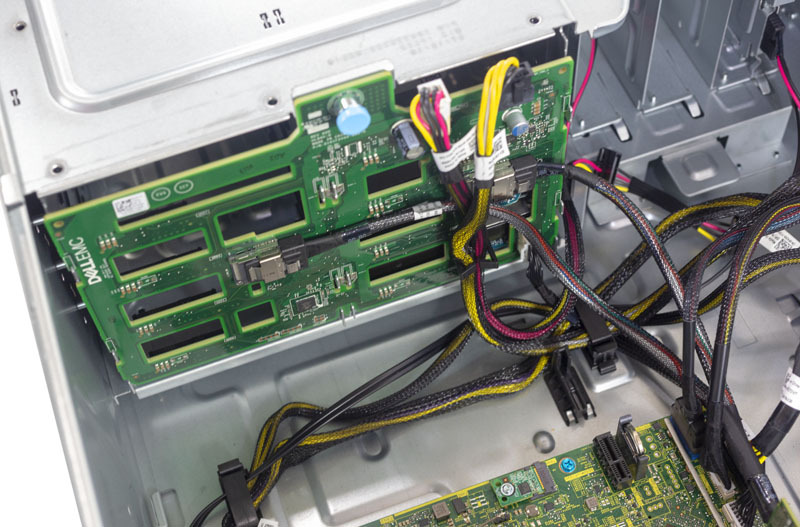 To use 8×3.5 hard drives (total), do you need a card like the LSI SAS 9211-8i to utilize a second 4×3.5 drive cage? Nothing says hands on review quite like a discussion about the cover latch. Classic STH! I wonder why they made this server so big. Most companies are trying to make things more compact. You could have mentioned that the bigger size isn’t good for office managers. If it takes up another half a square foot that’s several dollars a month for space which you’ve gotta add in TCO calculations. It looks SIIIIIICK though! Like a tank of a server. You do realize the size has been the same for generations now and is due to being able to rack mount it. I was pricing one of these machines on the Dell website (large corporate or IT buyers generally not using such means) last night and disappointed that everything today is ala carte pricing and even for mundane items one should not have to pay for to have included with any computer e.g. technical document on DVD. Such approach to “one of” sales not the mindset what made Dell famous in the USA or why it was Dell even developed a large custom base during a period of high hardware competition choices (1990-2000). My first Dell up right computer was a dual Pentium Pro, my last Dell up right a dual P4, afterwards changing brands. Worst, Dell’s ala carte pricing is driven in part by an unrealistic desire for constant, exponential revenue growth regardless of unit sales increase, a.k.a. corporate greed predicated on non equilibrium economic models, thus fitted with arbitrarily high retail pricing of an abusive nature rather than projecting an innate desire to benefit every day Americans, the Dell machine not assembled in the USA as should be, but Mexico. The pricing schedule today, rather than in the past, when much of the pricing was premised more about a 1:1 product offering of a substituting nature, e.g. not having to over pay for intentionally proprietary (high profit margin for integrator and Apple ethos) hardware, with Dell no longer incorporating name brand OEM provider components and mountings as was their former Dell Sony displays, Dell Adaptec RAID controller… is ripe today for over pricing such as the minimalist Dell PERC to excessive pricing for Dell case front bezel. To close, the motherboard in this computer, rather than designing a upright computer case that opens from the left (seen face on), is inverted top to bottom, thus not a proper mounting solution, but a disrespectful engineering short cut (hack) since this motherboard per peripheral slot direction, is intended to be oriented in the opposite (peripheral slots to the left, not right) direction. 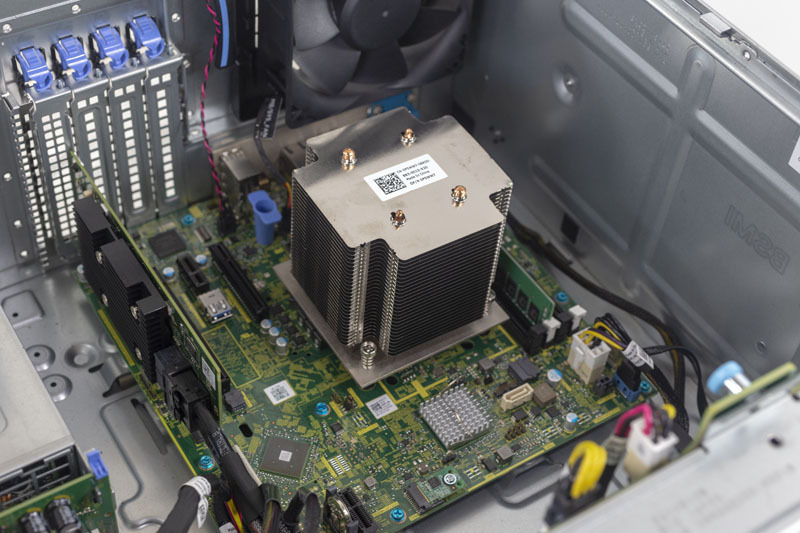 The purpose of the orientation is to prevent dust from accumulating onto the top (primary component side) surface of peripheral slot mounted PC board along with reduced thermal evacuating efficiency should the computer case be placed in an upright position and given situation in the photo, with dust potentially accumulating onto the top side of the PERC heat sink. Side note, I have not liked the manner in which a full size upright Dell computer case opens, since my dual P2. Anybody know what the metal cage looking thing in the top right (in front of the psu) is for? It looks HUGE! Was this designed for the China market where they like everything big? The cable routing is a mess, it looks over-complicated. Yes, you will need a card to support the additional drives beyond 4 drives. Does this Server support puce bifurcation? I want to add a dual M.2 card for dual NVMe with the x8 slot. Such a card exists from Supermicro, but need PCIe bifurcation.